A B-17 Flying Fortress (serial number 42-107124) of the 351st Bomb Group flies over Polebrook. Captain John Paul Carson Jr. , January 1944; A/C #42-29863 (RQ-Y) "Kentucky Babe"
Information (in Swedish) at crash site memorial B-17, 42-31192 (YB-R), Farabol, Sweden. Oct 7th 1944. Picture shows some of the crew members: "Top row, from left: Candelaria; 2nd Jensen; 3rd Crawford. Front row, 2nd from left: Wilson; 3rd Christiansen and Rooney". Memorial at site for crashed B-17, 42-31192 (YB-R), 351st BG. Farabol, Sweden. 351st BG, 509 Squadron crew of the Portland Rose, AC 44-6907. Middle first row the pilot, Lt. Robert Kern Potter, to his right CP Lt. Jacob McClenny. Other crew members Nav. Lt. Albert Minton, Engineer/TT Sgt. James McDonald, TG Sgt. John Cauthen, BT Sgt. Wilbur Leblanc, LWG Sgt. Robert Barr, RO Sgt. Donovan Edwards, NG Sgt Maxwalten Hennings. "Portland Rose" AC 44-6907 . Commanded by Lt. Robert K. Potter on 17 of 33 missions. Polebrook was laid down for RAF Bomber Command use in 1940-1941. Built by George Wimpey and Co. Ltd, it had short runways which were lengthened for USAAF heavy bomber use. The RAF used the base for operational trials - including of B-17 Flying Fortresses. In 1942, the airfield was handed over to the Eighth Air Force. Accommodation for over 2,000 personnel was provided on sites built in woodland to the north of the station. The 97th Bomb Group used Polebrook first, before the 351st Bomb Group moved to the airfield in the spring of 1943. They remained at the base until the end of the war. 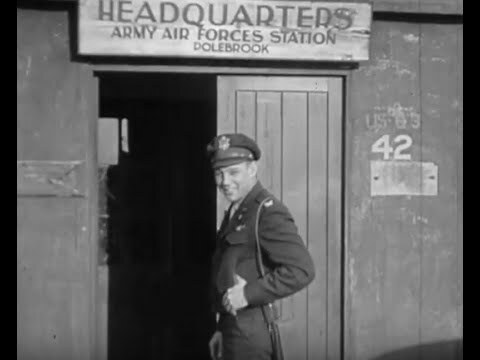 RAF Maintenance Command took over in 1945, and in 1947 Polebrook briefly became a satellite for RAF Upwood. It was declared inactive a year later. In 1959, however, Polebrook became home to a Thor ballistic missile squadron, which remained until 1963. Shot down 28 May 1944 in B-17 42-97472. Evaded. Connected aircraft records that have 'Polebrook' in their biography fields.